Said to be the final film of Steven Soderbergh (‘Ocean’s Eleven‘ (2001), ‘Contagion’ (2011)), ‘Side Effects’, at first glance, seems to have everything going for it: a great director, impressive cast and an interwoven story, promising a gripping thriller ahead. However, ultimately, ‘Side Effects’ demonstrates that even these attributes are sometimes insufficient to make a great movie. In ‘Side Effects’, a young woman, Emily (Rooney Mara), finally welcomes her husband, Martin (Channing Tatum), home after the latter has spent some time in prison. Finding herself unable to cope with her new routine, Emily, who also has a history of depression, becomes very melancholic, and is soon prescribed a new drug, Ablixa, to help maintain her mood. Her new psychiatrist, Dr Jonathan Banks (Jude Law) takes charge from her old psychiatrist, Dr Victoria Siebert, (Catherine Zeta-Jones), and promises to monitor Emily’s progress closely. Then, when Emily’s husband is brutally murdered at home, the new drug becomes the prime suspect. First, the good things: ‘Side Effects’ is stylish and entertaining. Steven Soderbergh, who also previously directed ‘Erin Brockovich’ (2000) and‘Traffic’ (2000), clearly knows the thriller genre well. The issue of the danger of prescription medication, and its proliferation, are also presented well in the movie, almost echoing ‘Psychiatry: The Marketing of Madness: Are We All Insane?’ documentary. Neither the cast nor the acting is flawed. Rooney Mara gives a good performance as Emily, a shy, mysterious young woman trapped in her imagination and sorrow. Jude Law is also surprisingly good in the role of her psychiatrist. The first scenes of ‘Side Effects’ almost remind of Polanski’s ‘Rosemary’s Baby‘ (1968) with its eerie music and the shot of apartment buildings, introducing the audience to the “modern” horror aspects of the movie. Here, however, we come to the first and main problem. 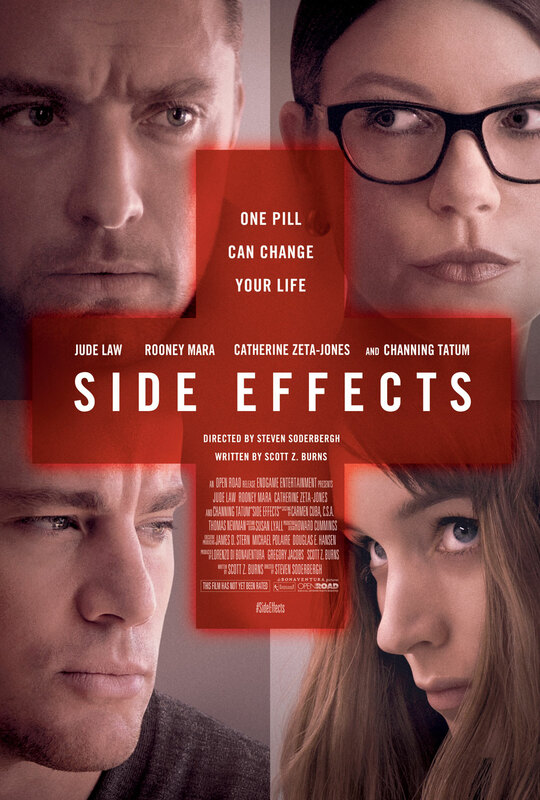 However fascinating maybe the subject matter: prescription drugs, their ethical implications, a gruesome murder-mystery, ‘Side Effects’ contributes very little by way of originality to the already mile-long chain of similarly-themed films. Beginning with ‘Spider’ (2002) and ending with ‘Shutter Island’ (2010), previous films have touched upon the theme of ‘Side Effects’ numerous times, but, arguably, have done a far better job at that. The final plot twist of ‘Side Effects‘ is very underwhelming and can be guessed: nothing will end up as it seems at first, and the most innocent-appearing person in the movie, i.e., the so-called “victim”, will turn out to be the main villain. In that vein, nothing in particular stands out in ‘Side Effects’. As Roger Ebert astutely put it in his ‘Fight Club‘ (1999) review: “A lot of recent films seem unsatisfied unless they can add final scenes that redefine the reality of everything that has gone before; call it the “Keyser Soze syndrome” (from ‘The Usual Suspects’ (1995)). And, as we think about it more, ‘Side Effects’ becomes something of the badly “re-cycled” and already forgotten film ‘Malice’ (1993). In that movie, the victim of a botched medical operation, played by Nicole Kidman, had actually turned out to be the guilty party’s main accomplice, and the two villainous lovers (the doctor and the victim) had actually set up an intelligently-construed trap for everyone in the movie in order to get their hands on the millions. While in ‘Side Effects’ the two lovers are there to kill “the husband”, in ‘Malice’, the two lovers are there to hoodwink and blackmail “the husband”. The movie is also “confused”, maybe even as “confused” as Emily is in the film. Emily’s severe depression seems very odd: here we have a young women who has recently welcomed her husband from prison, and maybe they do not live with such a lavish lifestyle anymore, but should she not now be happier? No, she is actually sadder. This uncertainty about the cause of Emily’s depression actually weakens the plot, and makes the movie more predictable towards the end. Then, follow the so-called “twists”, which are unremarkable in retrospect. In fact, far from being defined as “twists”, they can be described as a series of predictable “confusing moments” thrown sporadically here and there in the movie just to confuse the audience more and unnecessarily. When the main “twist” is finally revealed, far from being thrilled or in awe, the audience can, at best, experience a slight surprise, but, on the whole – indifference. Moreover, beyond this point, there is virtually nothing worth commenting about in the movie: all the characters are dislikeable, and nothing in this film makes any effort to involve the viewer emotionally. One other “weakness” of this film is the way it portrays the legal side of affairs. Frankly, ‘Side Effects’ is ludicrous from a legal point of view. The imposition of blame when a crime is committed is turned on its head in the movie. In that respect, it becomes worse than ‘Fracture’ (2007) (co-starring Anthony Hopkins and Ryan Gosling), where the whole premise is that X, knowing for certain that Y committed the crime, cannot find any “legal” evidence to prove it and his case fails, even though it could not have done anyone but Y (a factual evidence in itself). Coupled with this is, again, the absence of any effort to make the audience care for anybody in the movie, and the failure to move the audience emotionally. As one cannot sympathise with anyone in the film, ‘Side Effects’ becomes something like watching three strangers rip each other off for money, and then shift the blame around. Good review. Just a bunch of wacky, wild, and crazy fun that I really enjoyed. I highly doubt this will be Soderbergh’s final flick, but if so; he’s going out on a pretty strong note. Nice review! This movie really disappointed me. It had some really good elements to it but I thought it fell apart at the end. The big reveal did nothing for me at all. Good review. I guess I liked this one a little bit more because I did not know much about it going in, and that is the best way to enjoy something like this. It’s a pulp/trash movie, but it’s one done with great style. Totally agree. It’s that kind of movie that looks good when you watch if but as the screen goes off you understand how forgettable it was.